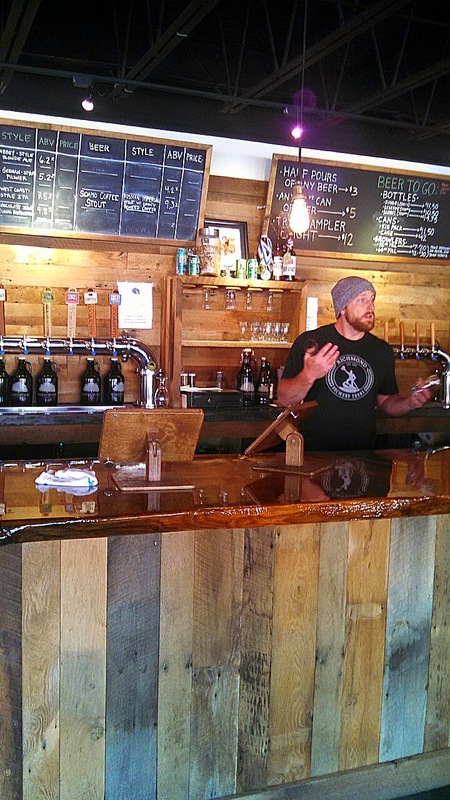 I was surprised this past Saturday by Jess with an afternoon of Richmond Brewery Tours! WOO WOO!! The event started promptly at 11:30am with our tour guide going over a brief history of beer, reviewing the vital ingredients, mentioning the reinheitsgebot, and concluding with the breweries we were to visit that afternoon: Legend, Midnight, and Hardywood. Before leaving we had 2 samples at Cap Ale House, Blue Mountain’s Kolsch and Chaos Mountain’s Smokey the Beer, a smoked porter, aged in bourbon barrels. Chaos Mountain brews just hit Richmond distribution so I was very excited to try one of their offerings which I thoroughly enjoyed. After waivers were signed and beers were drunk, it was time to load up the bus. With 14 people the bus was full. The company offers snacks (chips, pretzels, etc.) on the bus and encourages you to purchase beer at the breweries. The first drive was to Legend where we unloaded overlooking Richmond and the James River. We entered through the back entrance, which I never knew existed, and were seated in the restaurant along a table still overlooking the city. We ended up trying 5 beers: Lager, Pilsner, Brown, Golden IPA, and Hopfest. Oddly enough, I had never tasted their Lager or Pilsner. We did not hear much about each of the beers but a placard placed on the table explained each brew. It was here that I was quickly reminded that some people really don’t like hoppy beers which is great for me since I get to enjoy what’s left in the pitcher. Like a good parent our tour guide gave us a five-minute warning and suggested we all use the restroom since our next stop was Midnight which was at least 20 minutes away. The trip to Midnight was comfortable thanks to the bus, purchased from the New York Transit Authority, and the safe driving of the tour guide. We arrived at Midnight’s new facility (which opened publicly in September 2014) and were greet by the founder/owner Trae Cairns. Our timing couldn't have been better as there was live music, food trucks, and their brand new Dark Winter’s Night which was released that very day. We were ushered into their brewing area and Trae lifted the partition that allowed us to enjoy our tastings next to the bright tanks. Trae briefly explained how Midnight began (with him homebrewing during the night while working full time in IT), the process of brewing (with equipment they acquired from Virginia’s O’Connor Brewing), and stayed while we enjoyed 4 beers: New Beginning Kolsch-style, Rockville Red, Not My Job Southern English Brown, and the just released Dark Winter’s Night Vanilla Double Stout. During our visit Trae also mentioned getting into bottling their beer (I even spied some empty bottles!). It was our first time to the brewery and we are already planning our next visit. The trip from Midnight to Hardywood seemed much shorter than the ride out to Midnight, possibly (probably) because of all the beer we enjoyed so far. We began our visit to Hardywood in their new building with the Tasting Room Manager pouring samples of their flagship Singel at the bar. He quickly explained the history of Hardywood, moving down the mural beginning with a kangaroo and ending with a recap of their business expansion in just over 3 and a half years while enjoying their newer Pils. We then moved to a second bar to enjoy the delicious Sidamo Stout while hearing more about their company as well as seeing one of the first beer cans ever to be sold, a cream ale Kruger’s here in Richmond. 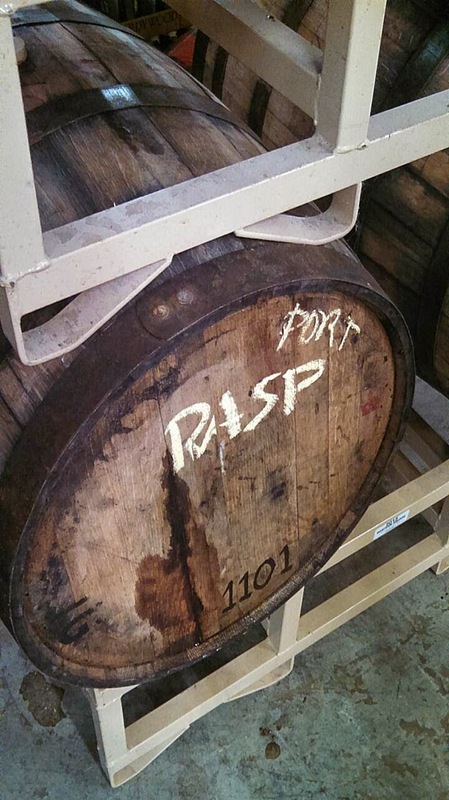 Before heading to their original facility, we walked through their warehouse where some exciting things were observed – barrels of 2015 Trickery, an insanely intriguing barrel with “port” and “rasp” written on it, and pallets full of fresh Great Return, Cream Ale, Capital Pale Ale. We ended in their original building at the bar overlooking their brewing operations while enjoying their Raspberry Stout. 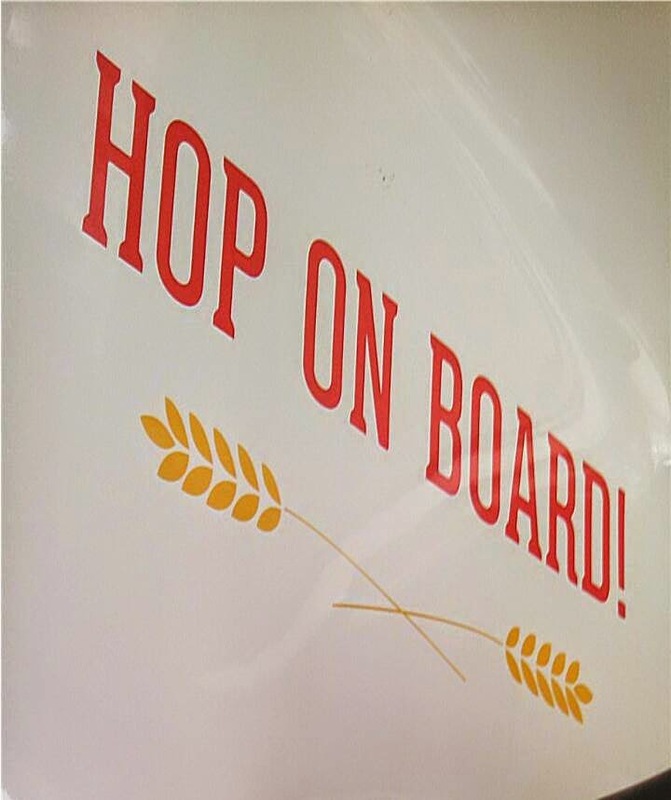 As it was our last stop we had more time to talk to other passengers of the tour allowing us to reminisce (and snob over) the early days of Hardywood: their tasty Virginia Strawberry, GBS before the perfect 100 from Beer Advocate, and maxing out their events. These early memories of Hardywood don’t make us better than others who weren’t around, just more fortunate. NOTE: We were at Hardywood the longest which is why I have pictures of their facility. It ended, of course, back at Cap Ale House. Each person was offered either a free pint glass or a koozie with nice looking t-shirts for sale as well. The tour was a great snapshot of the brewing scene in (and around) Richmond starting with earlier days of craft beer with Legend to the swift growth of Hardywood and the passion of locals who can’t help but end up in beer with Midnight. We tried 15 brews that covered a wide spectrum of beer styles and flavor profiles. The tour guide/driver was great, the bus comfortable, and the souvenir much appreciated. It was truly pleasant being able to enjoy all the beer without having to worry about driving, at least not until the tour ends. If you decide to take a tour, please be responsible - with at least 15 beer tastings it may not seem like a lot but it is so you may want to plan on either taking a cab home or staying downtown and eating before driving home. PRICE: For one person the cost is $65.00, but we also tipped since the tour guide was great. DURATION: It lasts approximately 3 and a half hours, which the guide kept us on track time-wise without being annoying or cutting our visits short. WHEN: The tours are Thursdays and Fridays starting at 5:30pm and Saturdays at either 11:30am or 4:15pm with a personal tour at one of the three stops.